In case you’re not too familiar with classical music, Mstislav Rostropovich was a famous Russian conductor and cellist, recognized as one of the best ones of the 20th century. The 4+ star high-comfort vessel was named in the honor of this great man and many travelers admit that time spent on this Moscow to St. Petersburg cruise was as wonderful as his music. The ship was renovated in 2009-2011 and has a passenger capacity of 200. It can easily be compared to a hotel on water as its cabins, spread on all 4 decks, have modern amenities and feature large beds, private bathrooms, power sockets to charge appliances, TVs, phones, and in-room safes. Depending on room category, which, by the way, all carry the names of popular Russian theaters and museums, such as Mariinsky or Hermitage, travelers stay in cabins either with panoramic windows or balconies. There are four decks on MS Rostropovich. The top Sun Deck has a gym, playing room and an open-air area with a Solarium, the Boat Deck is where the restaurant Symphony and the River Melody lounge bar are placed. The Opera Restaurant is on the Middle Deck, the Main Deck houses the Conference Hall. Plus the ship has an elevator to simplify accessibility. Traditionally, the tour program starts in either Moscow or St. Petersburg, which are either the first or final destination of the trip. The group of travelers spends four days in each of them, exploring the top attractions of the cities with certified English-speaking guides. In Moscow the following places are on the agenda: the Red Square, St. Basil’s Cathedral, Tretyakov Gallery, Sparrow Hills, Kremlin territory and the Armory Chamber. The St. Petersburg guided sightseeing includes the Peter and Paul Fortress, Catherine’s Palace in Tsarskoye Selo, the Heritage Museum, and Peterhof. A big advantage is certainly the fact that while in Moscow and St. Petersburg, travelers stay in hotels that are in the heart of the city instead of onboard the ship, which means that they save a lot of time for commuting to and from the ports that are located in the outlying districts of town. Thus when the included guided program is over, they are free to explore the city centers on their own, set off shopping or dining in fine restaurants. The actual cruise part begins in several days after all the city highlights are seen. Included activities surely won’t disappoint, from the very first minute guests are greeted with traditional Russian Bread, Salt and Vodka. 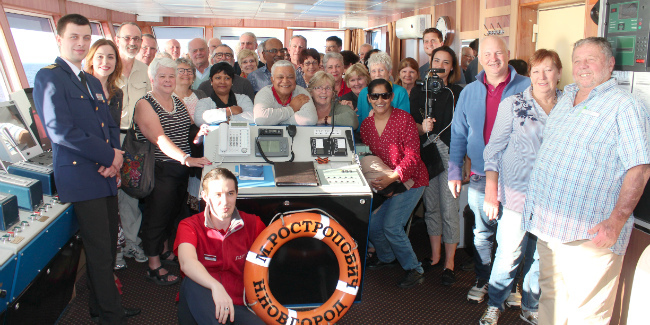 As the ship makes its way along the broad waters of Volga River past the picturesque Russian countryside, the leisure options change from day to day, offering not only fun and entertainment but also educational lectures and classes. Guests are welcome to participate in lectures on Russian history, classes of Russian language, cooking workshops, and even traditional singing! Costumed tea parties, evening folk shows, and the much-favored Vodka tasting party are only some highlights of the St. Petersburg to Moscow cruise. As for food, during the cruise part, guests are treated to delicious meals of European cuisine, prepared by real pros, every day of the trip, several times a day. Water is served with every meal, wine with each dinner. In Moscow and St. Petersburg travelers have several included lunches in top-rated restaurants. During the cruise, the ship makes stops in towns and petite villages along the way so that travelers can familiarize themselves with authentic Russian destinations. A real highlight of the trip is a stop in Kizhi, home to the jaw-dropping wooden Transfiguration Church that has 22 domes and was built without any nails. Other interesting stops include the Kremlin in Uglich, St. Cyril Monastery in Goritsy, and Mandrogi that gives an insight of what a real Russian village looks like and displays traditional craft making. A journey to the world’s largest country on board one of the Russian river cruises is a great option for those who wish to combine Moscow and St. Petersburg city sightseeing with a portion of laid-back cruising. Such a program is an all-embracing experience, not only full of fun activities but also showing the authentic side of Russia. And another great part about it is that documents for Russian visas are taken care of for you apart from the rest of the planning, making the process dozens of times easier!